Western blot analysis of extracts from HeLa cells, serum-starved and stimulated with insulin (100 nM for 5 minutes), with (+) or without (-) λ phosphatase treatment, using Phospho-4E-BP1 (Thr37/46) (236B4) Rabbit mAb (Biotinylated) (upper) and 4E-BP1 (53H11) Rabbit mAb #9644 (lower). Incubate membrane and primary antibody (at the appropriate dilution as recommended in the product datasheet) in 10 ml primary antibody dilution buffer with gentle agitation overnight at 4°C. Incubate membrane with Streptavidin-HRP (#3999 at the appropriate dilution) in 10 ml of blocking buffer with gentle agitation for 1 hr at room temperature. Do not add Anti-biotin, HRP-linked Antibody for detection of biotinylated protein markers. There is no need. The Streptavidin-HRP will also visualize the biotinylated markers. Supplied in 136 mM NaCl, 2.6 mM KCI, 12 mM sodium phosphate (pH 7.4) dibasic, 2 mg/ml BSA, and 50% glycerol. Store at –20°C. Do not aliquot the antibodies. Phospho-4E-BP1 (Thr37/46) (236B4) Rabbit mAb detects endogenous levels of 4E-BP1 only when phosphorylated at Thr37 and/or Thr46. 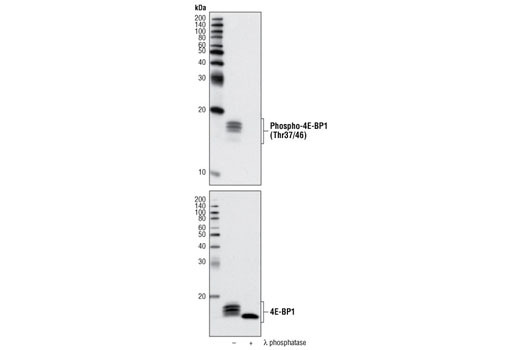 This antibody may cross-react with 4E-BP2 and 4E-BP3 when phosphorylated at analagous sites. Monoclonal antibody is produced by immunizing animals with a synthetic phosphopeptide corresponding to residues surrounding Thr37 and Thr46 of mouse 4E-BP1. This Cell Signaling Technology (CST) antibody is conjugated to biotin under optimal conditions. The antibody is expected to exhibit the same species cross-reactivity as the unconjugated Phospho-4E-BP1 (Thr37/46) (236B4) Rabbit mAb #2855.